Oxford White 2013 Ford Fusion Hybrid SE MULTI POINT SAFETY AND MECHANICAL INSPECTION PERFORMED BY CERTIFIED TECHNICIAN, DETAILED INTERIOR/EXTERIOR FOR DELIVERY, Bluetooth Hands Free, FUEL EFFEICENT, GREAT COMMUTER CAR, Fusion Hybrid SE, 2.0L I4 Atkinson-Cycle Hybrid, E-CVT Automatic, Oxford White, Dune w/Heated Leather Front Bucket Seats, 6 Speakers, Alloy wheels, Brake assist, Delay-off headlights, Electronic Stability Control, Fully automatic headlights, Radio: AM/FM Stereo/Single CD/MP3 Capable/SYNC, Rear Video Camera, Remote keyless entry, Security system, Speed control, Steering wheel mounted audio controls, Traction control, Variably intermittent wipers. CARFAX One-Owner. 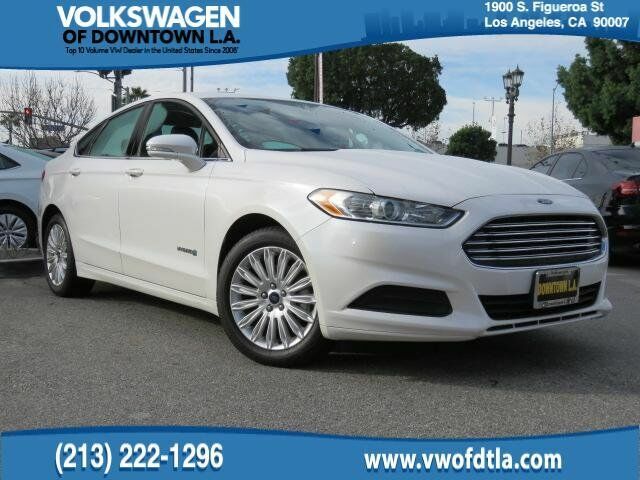 44/41 City/Highway MPG FWD 2.0L I4 Atkinson-Cycle Hybrid E-CVT Automatic Clean CARFAX.